Despite an increasing interest and need for constituent input and feedback, there seems to be a diminishing number of trustworthy, safe, reliable ways to solicit those thoughts and ideas. Traditional forms of engagement on public issues include holding in-person or “tele” town halls, distributing newsletters or sharing updates on social media. Even though these traditional avenues persist, they increasingly fail to accomplish the objective of gaining an accurate and verified sentiment that is representative of the target audience. Town Halls are often under-attended, and social media is rife with trolls, unverified voters and a host of privacy concerns. Since the beginning, it has been our intention at Polco to build an ecosystem that fosters a habit of civic engagement - a single place where everyone from a city manager to a state representative or a journalist can tap into the collective thoughts, ideas and needs of a broader community. The beauty of this ecosystem design is that everyone benefits from increased levels of engagement. The more organizations and decision makers are willing to involve constituents in their decision making process, the more people want to participate - and the more people that want to participate, the easier it is to get representative, reliable information. recently, we’ve seen this story develop in our home state of Wisconsin. Since last August, a statehouse focused news outlet has diligently posted bi-monthly content and questions about topics relevant to current legislation or political news. Originally hoping to learn the genuine sentiment of their readers and the Wisconsin electorate as a whole, they have averaged a 41.36% increase in respondents per-post since December of 2017. 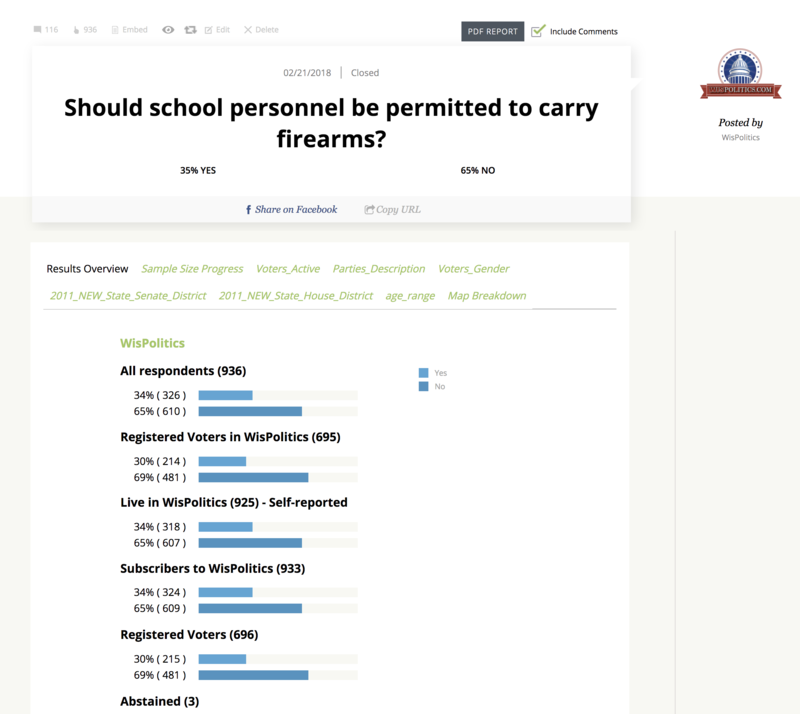 Their success through a steady flow of up-to-date and relevant content was most recently highlighted in late February when they released a question that attracted over 700 respondents within 24 hours of posting - most of whom Polco was able to confirm as real, verified residents of Wisconsin. Coupled with their growing success has been the acceleration of municipal engagement with our recent city and town launches throughout the state. Earlier this year, the City of Oshkosh enlisted our help when deciding what to do with 70 acres of public land. Their first post on Polco attracted nearly 1,000 respondents within a week; provoking an insightful “For and Against” debate on our platform, and ultimately providing the valuable input the Oshkosh Common Council needed from its residents before making a final decision. Many users who originally engaged through the statewide questions have since migrated over to respond to local questions from launches like Oshkosh’s. At the same time, a statewide official or organization is now able to solicit input from an increasingly large group thanks to growing city and county-level success. 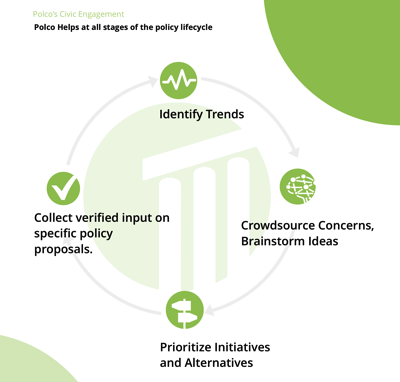 The whole ecosystem of engagement benefits, increasing the impact of citizen’s voices and reinforcing a habit of regular engagement. In an expanded use, we have also seen this growth happen in the districts of active elected representatives. Continuing on the above example, we recently had a state legislator from Wisconsin start asking questions on Polco. After a few rounds of engagement, his now significant number of followers and new Polco users migrated over to answer questions from the statewide news outlet. We expect to see more of this cross attraction as more legislators use the platform, and are excited to see the benefits of an increased population size on Polco all the way back around to local governments. All of these actions increase user activity and make it easier for more people to be a part of the conversation. Perhaps most importantly, this overlap in an energized user base lays the foundation for organizations and representatives to arrive on Polco with an established, eager constituency that is ready to engage. As the trend continues, legislators will be able to more accurately represent the views of their constituents given this larger pool of input from those who elect them.